We hear about new toxin dangers every day. From Bisphenol A – BPA in canned foods to toxic baby bottles to chemical enfused cleaning supplies. Is enough being done to protect us from these and other chemicals that can harm us and our children? 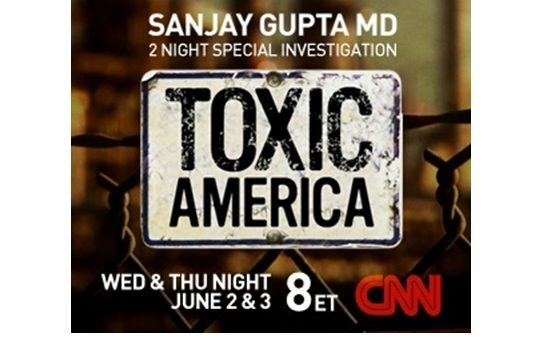 Watch Toxic America, a special two-night investigative report with Sanjay Gupta M.D., June 2 & 3 at 8 p.m. ET on CNN to find out. Both nights of Toxic America will be educational for viewers but if you’re an expectant mama you’ll especially want to tune in for the second night’s episode on June 3rd which focuses on expectant mothers and the unseen toxins passed on to their children. The second night of Toxic America, Toxic Childhood, airing on June 3rd, takes an in-depth look at the hidden effects of toxins on all people, especially pregnant mothers. The Toxic America team dissects the latest science on how to minimize risks to pregnant woman and children from potentially harmful chemicals found in the air, in homes and in common household products. Exposure to car and truck exhaust in the womb has been shown to result in lower IQ at age five. Right now you can visit the Toxic America website for special features related to toxins such as ADHD and the pesticide exposure link, how to protect yourself from five common chemicals, what types of plastics commonly contain BPA and much more. Then on June 2 and 3 tune in to Toxic America for the whole story. We hear about new toxin dangers every day. From Bisphenol A - BPA in canned foods to toxic baby bottles to chemical enfused cleaning supplies. Is enough being done to protect us from these and other chemicals that can harm us and our children? Watch Toxic America, a special two-night investigative report with Sanjay Gupta M.D., June 2 & 3 at 8 p.m. ET on CNN to find out. Both nights of Toxic America will be educational for viewers but if you're an expectant mama you'll especially want to tune in for the second night's episode on June 3rd which focuses on expectant mothers and the unseen toxins passed on to their children.